Here you will find Information on Bulldog health, training, conformation, care and more. 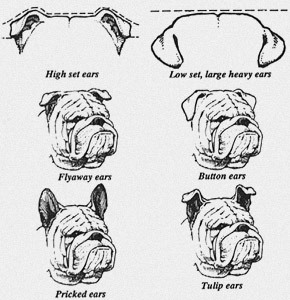 First, some images to show how a Bulldog should look and how it should not look. EARS, the right and the wrong.. These dogs are small in stature but wide and compact with thick, massive heads. The muzzle is short. The coat comes in many colors, including fawn, white, black & brindle. Because the stocky legs are set squarely at each corner of the compact, muscular body, the Bulldog's deliberate gate has become a waddle. They are good family dogs, known for their courage and their excellent guarding abilities. These dogs need little exercise or grooming except for the face which should be wiped daily in the face folds with a damp cloth. They weigh 50-60 lbs. (male) 40-50 lbs. (female) and stand 12-16" at the shoulders. Click here to view our puppies. The English Bulldog is affectionate, uncomplicated, gentle, intelligent, sensitive, and fearless. It is known for its loyalty; its happy-go-lucky attitude is in sharp contrast to its sour face. English Bulldogs are happiest by their owner?s side and will misbehave if ignored. English Bulldogs are active, alert, and playful, but not unduly boisterous. They enjoy mixing with other dogs and household pets. They are great with children, well behaved, adaptable, comfortable companions with an affectionate nature and even disposition. Some English Bulldogs are cautious with strangers, but most are friendly to everyone. They are likely to drool when panting excessively or after drinking. They also generally snort and snore quite loudly. When the English Bulldog is shedding, use a rubber brush to remove dead hairs. A moist wipe will occasionally be needed to clean the facial and tail folds to prevent skin irritations and infections; soft tooth brushing with an approved toothpaste is also recommended. The English Bulldog has a lifespan of 8-12 years. Due to its facial features, it is susceptible to breathing problems and skin infections, and most are delivered via Cesarean section due to their large heads and an elevated risk of water puppies. Frequently raised by hand as their dams are rarely maternal. Most English Bulldogs cannot swim and should never be left near water unattended. Even those rare bulldogs that can swim will tire quickly. They are averse to hot weather and overheat quickly, never leave them outside without supervision, even in a fenced yard with shade available. Pulmonary edema causes a terrible death and can occur extremely quickly. Bulldogs are eternal puppies ? they really never grow up. They?re playful and they?re clowns. Are you ready and willing to make the commitment of time, attention, caring and love that a n English bulldog needs? Bulldogs are not vicious or even necessarily aggressive, although they can be very protective of their humans. They are intelligent, good-natured, courageous, fiercely loyal, and can be trained, as long as they think it?s their idea. Stubborn, you say?? Oh yes, these little angels can be very stubborn. You will need to be very patient. Bulldogs are loving and gentle, especially with children and usually very accepting of other pets in the family, more so if brought into your family as a pup. However, they may drive your older dogs or cats crazy with their curiosity and silly antics! Do you have sensitive hearing? Bulldogs are a veritable symphony of sound effects: snoring, snorting, grunting, and other ? um, gastric emanations. Yes, bulldogs have gas ! Oh, speaking of gastric emanations: Do you have a highly developed sense of smell? Are you looking for a dog to chase a ball, join you in your morning jog or catch a Frisbee? Then more than likely an English bulldog isn?t the dog for you. However, if you?re looking for a dog to love you unconditionally, curl up beside you (or park their behind on your feet) waiting for you to pat them on the head, only to have them flop on their back for a tummy-rub, then a bulldog is probably right up your alley. Protrusion of the tear gland associated with the third eyelid membrane in the corner of the eye. This can be treated with antibiotic and steroidal ointments in the eye or removed surgically, which is the most recommended. This occurs when the eyelids roll inwards, causing the eyelashes to rub against the eye. Surgical correction is needed when this occurs ? left untreated, Entropion will cause permanent damage to the eye. Bulldogs are notorious for limping during their rapid growth in the first year. Veterinarians that are unfamiliar with the breed often jump to quick conclusions that there are structural problems with the animal. Keep you bulldog moderately active, avoid excessively jumping off furniture, decks, etc. These dogs are very heavy on their young joints and the sudden jolting can cause swelling and pain. If your English bulldog is limping, keep him/her quiet for 24 hours, and preferrably crated, you can safely administer one 200 mg advil every 12 hours to ease the pain and help control the inflammation. In most cases the periodic limping associated with a bulldog's developement will go away at 12-18 months of age. This is an abnormality of the hip joint, which can cause arthritis in later years. Besides genetics, the cause is suspected to be rapid growth and weight gain. This is another reason to keep your bulldog at a healthy weight, as bulldogs can easily become obese. Treatment for hip Dysplasia can range from steroids and anti-inflammatory medications, to aspirin, to surgery. Always work with your vet on a treatment plan. Yet another reason for a healthy diet and regular exercise. Extra weight can put added stress on their breathing and heart. 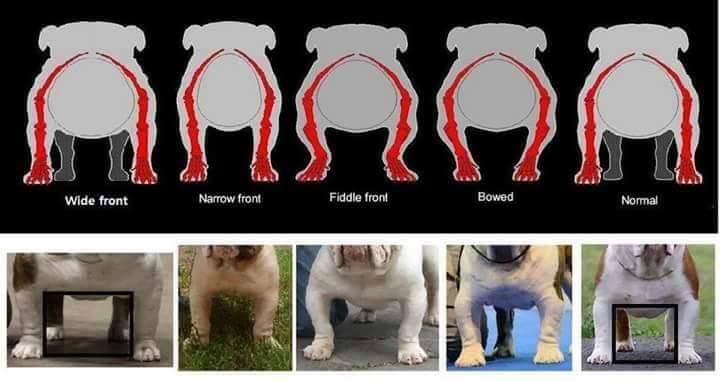 English bulldogs are rarely able to breed independently due to their body shape, so if you?re planning on breeding in the future you?re looking at several vet appointments and artificial insemination. Bulldogs are rarely able to whelp freely due to the bulldog puppies? large heads and shoulders, coupled with the mother?s narrow hips. 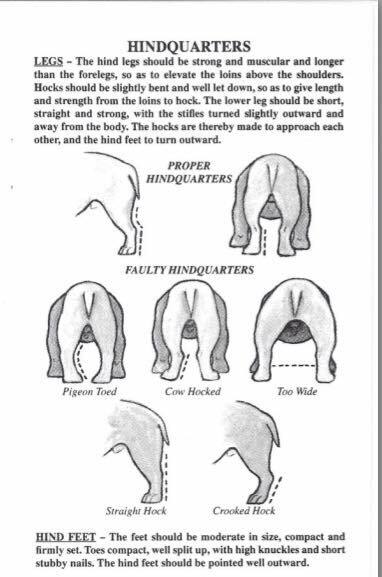 This means that you?ll almost always be looking at c-sections on your female bulldog. There are some who attempt to let their bulldogs free-whelp, but I personally won?t chance the health and welfare of not only my mothers, but of those precious bulldog puppies, to let them try. Since c-sections are physically hard on your bulldog?s health, muscle tone, joints, etc., this also significantly lowers the number of litters you should allow them to have. My vet recommends no more than 3 litters in a female?s lifetime, and then, only if there are no complications. English bulldog mothers rarely can raise their young and require a great deal of help and patience from their owners. Many do not even produce milk and lack the ability to form the maternal bond after the c-section, therefore refuse to acknowledge their pups. In these cases the puppies must be entirely hand-raised, meaning bottle feedings and stimulation to assist bodily fuctions every 2 hours. It's demanding of your time, energy and definitely not for the faint of heart. When English Bulldog puppies are born many don't understand or realize that puppies are born without pigment, teeth and that their ear canals and eyes are closed. They usually weight anywhere from 8 pounces to one pound at birth and usually do not have wrinkles at this age. As they grow they start to get pigment in at about one week of age and this fills in gradually over the course of time, not all at once. Ear canals and eyes start to open as soon as two weeks but some a bit later. Eye color is almost always a grey blue at first. and changes over time gradually. At about 4-5 weeks old bulldog puppies start to get enough fat under their skin to have some wrinkles. Because they are so short in height and length they tend to look like fat little balls of puppies. They look cute as buttons and will continue to grow and look more fat and adorable until about the age of 9 weeks old. At about 9-10 weeks of age they start to go into what we call their gangly phase(equivalent of those awkward teenage years.) This is when the buyers and novice people to the breed start to complain and panic. English Bulldog puppies will start to get a leggy and gangly look about them. This peaks at about 16-24 weeks of age. Most buyers then wonder what they have bought. The puppy looks leggy, too tall, it will likely have a narrow head which can makes ears look big and floppy at this time. Puppies at this age will have also shed any wrinkles that once had. The new owners not understanding that this is a normal phase of development for the breed will start to create havoc for their breeder most of the time. 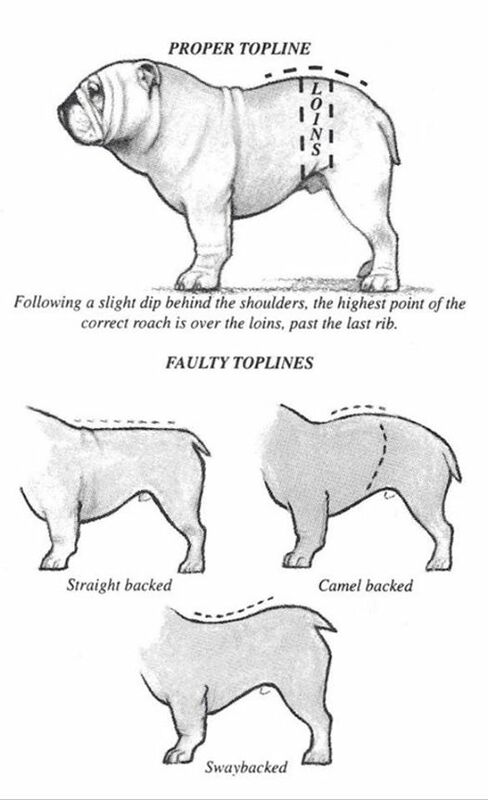 This is the most common time-frame of complaints, mostly from first time owners of the breed. One needs to understand that all species go through an awkward phase while they undergo great bodily transitions and growth. Including human children usually starting around the age of 7 and many times it goes in to the teen years before the ugly duckling becomes the swan. One also has to know how their bloodline develops. If you buy two English Bulldogs understand that each bloodline may go through a completely different magnitude of this phase than another bloodline. Sometimes the larger the English Bulldog will be as an adult, means the more the phase will take its toll. It is not until about 10 months of age that you will start to see the Swan appear from the Ugly Duckling phase of the gangly phase. Even still it is a growth process over months not all at once. Bulldogs don't truly complete the entire growth process until about 2-3 years of age. At about 6-12 months you will see the English Bulldog jaw shoot out and turn up, the head start to spread and grow wider, the brisket or bottom of the chest drop, the width of the bosom spread, the bone thickness will get thicker and last but not least the lovely wrinkles start to fill in again. This is when you start to see the gorgeous bulldog you wanted appear.